Francis Aldridge, son of (probably) Francis Aldridge and Henrietta Ritter Prince, was born in Wilkes County, North Carolina. He and his first wife, Margaret Cole, whom he married in Rutherford County, North Carolina, in 1789, moved further west to Kentucky, probably Fayette County. After Margaret's death he married Mary "Polly" Harper in 1805 and they moved to Pulaski County Kentucky. Most of his children had moved away by the time Francis wrote his will on 8 July 1841. His daughter Rebecca was a widow with two sons by that time, her husband, Joseph Johns, having died. Thus he gave all his estate, both real and personal, to his wife Mary and, after her death, to Rebecca, whom he calls Rebecca Jones, and to her two sons, William and Franklin. His other children are all mentioned in the will: David, Eligah (Elijah), Nancy Hutson (Hudson), Margaret Mour (Moore), Thomas and Frances (Francis). He names his wife Mary as executor. 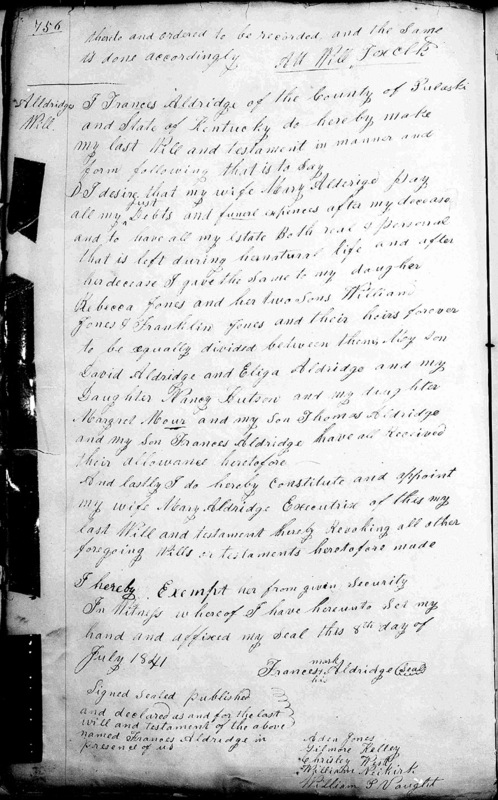 On the page following his will is the court record noting that the will was produced in the courthouse in Somerset on 19 May 1845 and was proved by oaths of the witnesses to the will. Will: Francis Aldridge, d.1845, County Courthouse, Pulaski County, Kentucky. Will Book 3A, 1838-1845, pp.756-757. FHL MF 804642.